Aventurine is the stone of good luck and abundance. It also brings joy, balance and clarity. It is a great crystal for soothing fears about money and is also considered the gambler’s stone since it brings good fortune in money matters. Aventurine is an all-purpose healer. Green is the colour of healing, and aventurine is effective at dissolving emotional blocks, particularly at the heart chakra level. 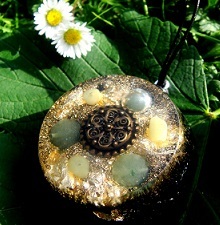 It is good for balancing emotions, and aventurine orgonite should be worn during stressful periods. It is also good for physical healing. It also carries a strong earth energy, and can be used for improving ones connection with nature. It is a helpful stone when dealing with EMF and environmental pollution. Aventurine is a stone of prosperity that increases qualities of leadership and enhances decision-making abilities. 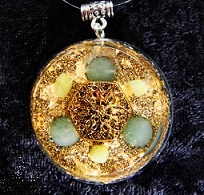 Aventurine orgonite will help soothe worries about finances and will stabilise financial matters. It is useful when interviewing for jobs or taking part in any business dealings. It is said to attract good opportunities and increase insight and confidence in business and financial matters. It is a good stone for entrepreneurs. Aventurine unites the emotional, mental and spiritual bodies and brings you back to your natural rhythm. It dissolves negativity and balances the yin and yang energies. It also allows you to release your attachment to outcomes and be more present in the now. It is a very soothing stone which is particularly effective for emotional healing, especially when worn over the heart chakra. When worn during stressful periods, it helps balance the emotions. You want to increase your connection to nature. If you want to buy an aventurine orgonite pendant, including the ones pictured on this page, head over to the aventurine orgonite section on the Orgonise Yourself Store. 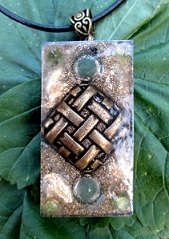 I am interested in purchasing adventuring pendant. However, I did not see pricing and ordering option. I don’t have any aventurine pendants at the moment unfortunately, will try to put some in my shop in September. You can see all items for sale by visiting my orgonite shop.